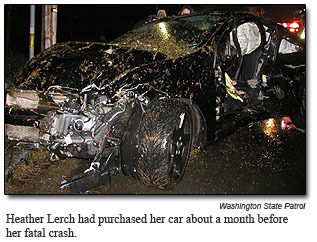 In the days that followed a horrific crash on Thurston County’s Littlerock Road in late February, small articles in local papers reported that 19-year-old Heather Lerch had been speeding when her car struck a guardrail at roughly 60 miles per hour. 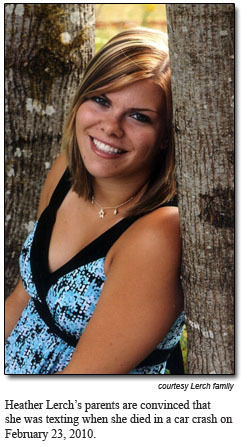 The young woman who’d graduated with honors last year from Tumwater High School died instantly. Having pieced together information from police, the coroner and phone records, Dan and Wendy Lerch say they’re now convinced that their daughter was texting when her car left the road. “There’s no doubt in my mind. Texting was 100-percent involved,” Dan Lerch said. 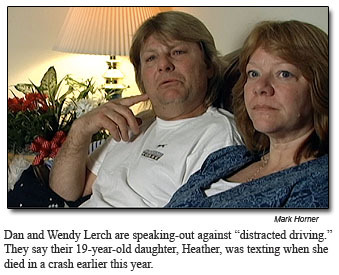 It’s why the Lerch’s have agreed to appear in a Department of Licensing video with a simple message: Don’t text or do anything else that can distract you while driving. The video (seen below) is about 5 1/2 minutes in length. A separate 30-second public service announcement also features footage from the video. The state of Washington is taking aim at distracted drivers. A new cell phone law goes into effect in June. It’ll make talking or sending text messages while holding a wireless device a primary traffic offense. That’s the part of the message that lends itself to words. Losing a child is another matter. A new look to driver licenses and facial recognition software will make it harder for identity thieves to do business in Washington. The new driver license look. DOL is expanding the use of facial recognition technology, a security measure already used in the Enhanced Driver License program, to safeguard regular driver licenses and ID cards. Changes to the driver license are coming as well — by shifting the picture to the left side and adding an identical but smaller, shaded photo on the right, the licenses will be harder to fake. The new design will be phased in as people renew or replace, starting in June. Essentially a math-based facial mapping system, the software creates unique facial “templates” based on each driver license or ID card photo to identify potential matches of the same face associated with different names. From there, Department of Licensing investigators take over the case, examining actual photographs and other information to determine if criminal activity, including identity theft, is occurring. Investigators say most matches will be easily resolved; the results of marriages or legal name changes, while some will be clear cases of criminal activity. They’ve already linked one individual by photograph to 36 different identities. The system can only be accessed by investigators with the Department of Licensing who have gone through extensive background checks. 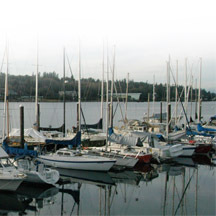 The current owners of Washington’s 286,597 registered boats and watercraft will receive a postcard this week encouraging them to sign up to receive annual registration renewal reminders by email because paper renewal notices are being discontinued. Paper renewal notices for boats and other watercraft are being discontinued to save about $150,000 per year and to gain the environmental benefits of sending them electronically. Signing up is fast and easy. The reminders will link to a DOL webpage that provides fee details and the necessary information to renew online. Renewing online can have new registration decals ordered and on their way within minutes of receiving the reminder notice. Boat registrations also can be renewed in person, but the owner should make sure to note the registration number on the bow of the boat or watercraft and take that information to a neighborhood vehicle licensing office. UPDATE: Please sign up for this new service using the DOL email renewal reminder page on the DOL website. When signing up, please do not enter the first “WN” characters from your vessel registration number. Skip the “WN” portion and enter the rest in the correct box on the online form to complete your request for email renewal reminders for your boat or watercraft. DOL is currently working to make this step of the process work better. Boat and watercraft registrations all expire on the same day every year—June 30. In addition to sending email renewal notices for boats each year, DOL will send an annual press release to help remind owners to renew their boat registrations and post reminders on the agency’s website, blog and Facebook page. DOL also would like everyone to consider signing up for email renewal reminders for cars and trucks, but paper renewal notices for those will continue to be sent unless owners choose to receive an email reminder. From time to time, representatives from major Hollywood movie studios contact the Department of Licensing to get help making feature films that have stories that take place in Washington. The production of a Twilight movie is a recent example. These studios generally hire a “prop house” to provide all of the various items surrounding—and used by—the actors to make their movie seem realistic. If a movie takes place in Washington, they need to put Washington license plates on the vehicles to make them look authentic. But here is the secret: these prop houses generally make their own Washington state license plates so they can control the numbers on them. To make realistic license plates, we are often asked two kinds of questions. First, the prop houses want to know about our state’s license plate configurations, meaning the combinations of letters and numbers used on various types of vehicles. They want to make sure that each type of vehicle in the film has the right type of plate number. This seems to be particularly important to them if they are making action movies, because they want to make sure that any police or emergency vehicles used in a production have authentic-looking plate numbers. We also get questions about what the movie folks call “clearances.” When they make their license plates, they want to make sure they aren’t using plates with numbers that are already being used on a vehicle currently registered in our state. They provide a list of plate numbers they would like to use and we let them know whether those numbers are in use. A portion of the fraudulent letter. An Alabama man recently contacted us here at the Department of Licensing for clarification on an email that appeared to be from DOL Director Liz Luce requesting that he fill out several forms to claim a lottery prize. The email was, of course, completely bogus. Please be on the lookout for this or similar scams. At a glance, the correspondence looks almost official. It has a DOL logo and text swiped from our website. It also appears to have been bundled with actual Washington state forms. DOL doesn’t ask customers to send personal information via email. You should be suspicious of any email or phone call from an organization asking you for information that they already should have. And, of course, you should be extremely wary of anyone telling you that you’ve won a lottery or contest you didn’t enter or trying to give you money you didn’t earn. You are currently browsing the Licensing Express blog archives for April, 2010.